For WIPs and more visit my other social media!  Which's your favorite #deltarune character? ~ . Ufff I took a long time to finish this but wooorth!!    hehe with a "free artistic licence" I gave them an upgrade on their clothes and weapons! also this drawing combines in color palette with the last painting I've been doing haha  ~ . Well as always hope you like it! Enjoy!  ~ . WOOOOOOOOOAAAAAAAAHHHHHHHHHH! How do you draw thisss?????? Amazing!! haha It's just fan devotion thank you so much! I'm glad you like it! Omg, I have never before seen so much color applied to an art-piece and look so amazing! oh wow! my soul ascended to heavens with that compliment makes me very happy because it tells me i'm doing the right things Thank you!! hahaha thanks! and I hope you are alright! IM OK, cant say the same for my "Engrish" hahaha!. All i ment to say was, The colours reveal such passion and glamour of the game. You really capture it. hehe thank you!! It makes me very happy that you enjoy my drawing!! I'm glad you like it! and thanks for the observations, i'll take a look! Me preguntaba si me permitirías agregar este maravilloso dibujo a mi grupo, ¡gracias por responder! It s increteble how colorful and inspiyering art u make!!! Nothing makes me happier than inspiring other people through my art! and I hope you continue enjoying my drawings! alright, this is actually great! I love the lighting effects in this and the shadows So pretty. Yeah, I definitely need to practice lighting, especially if this is what it can achieve! HHHooooowwwww? It's sooo cool. Can you give me a tip on how you make such amazing art? Thank you very much!! I'm flattered by your comment! Well some tips I can give you: find something you reeeally enjoy drawing! Use reference images, important!! pay attention to them, analyze and understand how anatomy works, how lights and shadow interact with surfaces, textures and details, etc. Extra: watch a lot of videos tutorials, speedpaints! maybe you find an artist whose method of drawing/painting suits your art style! I hope it helped you hehe and if you have any other questions just ask me! Thank you for the help I hope it'll help me to become a better artist. Thank you so much!! It was very fun to work with this color palette! 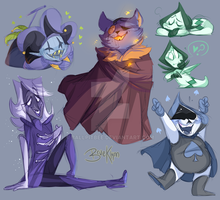 Are you going to draw any more Deltarune art? Thanks! and ummm I don't know hehe maybe! What do you have in mind? Any recommendation? A drawing of him would be nice. ooh yes! he's a very cool character! I loved his design when I saw him for the first time. I hope you draw him. I know whatever you draw will be great. This is absolutely gorgeous. Thank you!